I know it's scary to even consider negative thoughts for your wedding day, but..with some trepidation I present the following thoughts and experiences from my recent life as a willing and cheerful wedding guest. It’s the day every young girl dreams of – her wedding day. It’s supposed to be perfect – the perfect guy, the perfect ring, the perfect dress, etc. Hours of meetings with the event planner, dozens of cake tastings, and countless GChats with girlfriends have culminated in this one day, where you thought every scenario had been considered and planned for. If X happens, plan 743J will go into effect. If Z..., then 846C. But what happens if you haven’t thought of everything? I recently read an article about a couple that got married in the El Capitan State Park along the Pacific Ocean. The location was a special place for the two, and they had decided they wanted their family and friends to experience its beauty like they had countless times before. During the week prior to the event, the weatherman uttered the phrase that every bride who is planning an outdoor wedding wants to hear – it’s going to be sunny and clear this Saturday. In the blink of an eye, the big day was here. Yet, that weatherman, who had been cheered just days before, became this couple’s nemesis – today it’s going cloudy with a 100% chance for rain. And boy, was he right. 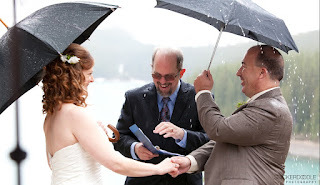 As the groom noted, “They say rain on your wedding day is good luck, and, well, if that is the case, then my sweet and I have the L-word coming to us by the truckload.” It didn’t just rain, it poured – 2 inches once everything was said and done. All their best-laid plans – the sunset cocktail hour, the fire-pit lounge, the custom-built tiki bars, the dance floor under the stars – all had to be reimagined and reconstructured within a matter of minutes due to Mother Nature and her plans. Needless to say, all present made the best of the situation, yet those wonderful tiki bars were no where to be found. She had spent half the ceremony swatting gnats and other colorful creatures away from her face. The other half was spent trying to hear the vows over the cacophony of birds that had appeared from seemingly out of no where. Her suggestion to me – do NOT get married by a pond. Looking back on these stories, I see how acquiring a tent could have easily prevented a few of these obstacles from rearing their ugly heads. Although we all dream that our wedding day will be perfectly sunny and 70 degrees, Murphy’s Law dictates that something will go wrong. However, a simple tent would have shielded all attending from the elements and provided the bride and groom with a much needed peace of mind. If you don't think you're going to NEED it because everything will be perfect, well you may want to conisder a "rain plan" or "nature plan" to cover your....guests (to put it mildly). Furthermore, as a guest of 3 to 4 weddings per year thus far (tragic), I ask you engaged couples to think of us, among all your other concerns. As much as I love to eat cake that has been pecked at by local wildlife or leave a wedding with a sun burn that’s edging on third degree status, I prefer not to. Instead I want to rave about the band or covet your wedding dress. Enjoy you and your family, while savoring the food that is second to none. Not cursing at the mud that has ruined my brand new high heels. That being said, if you DO consider a tent…please consider the tent vendor carefully because as the old saying goes, “you get what you pay for.” The poor couple below got a great bargain and I'm sure they'll remember their special, one in a lifetime moment....for all the wrong reasons. That must be the worst nightmare when it rains on your wedding day especially if you planned an outside event and in a country that gurantees sunshine most of the time. I hope this finds you well, have been catching up on all of your prior posts! Great information!